MedVet honors Service Dogs who dedicate their lives to serving the public. Service Dogs receive complimentary multi-specialty exams at MedVet Medical & Cancer Centers for Pets in Columbus and Cincinnati on Sunday, May 15, 2016. 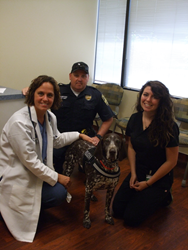 “It’s an honor to give back to dogs that help people every day,” says Dr. Terah Webb, the Ophthalmologist at MedVet Columbus. MedVet Medical & Cancer Centers for Pets is providing complimentary eye exams the entire month of May to service dogs during the 9th Annual ACVO®/StokesRx™ National Service Dog Eye Exam Event. Four of MedVet’s medical centers are providing these screenings – Columbus, Cincinnati, and Dayton, Ohio plus Lexington, Kentucky. These screenings are by appointment only. Over 45,000 service animals throughout the U.S. and Canada have been examined since the program launched in 2008, with over 7,000 dogs in 2015. More than 150 of those service dogs are examined at MedVet each year. In addition to weekday exams the entire month of May, MedVet Columbus & Cincinnati will also be holding a special screening event on Sunday, May 15, 2016 to facilitate multiple specialty exams to service dogs. On this day, service dogs will receive more than just an eye exam from MedVet’s ophthalmologists. Their appointment will include being examined by doctors from MedVet’s other specialty departments and will include a general physical exam. These screenings are by appointment only.